Definition: The lunate is disarticulated and, most commonly, displaced volarly from both the capitate as well as the radius. 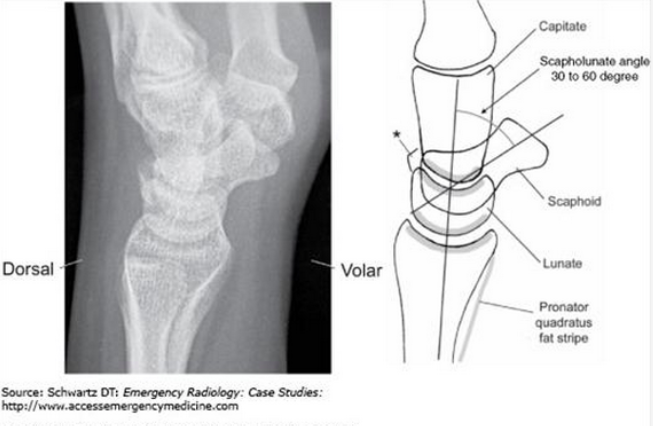 Patients will often be tender and swollen in the volar aspect of the wrist but physical exam is unlikely to be diagnostic. Important to perform and document an comprehensive neurovascular exam on injured limb as volar displacement of lunate can cause compression of median nerve in the carpal tunnel. On PA view of wrist evaluate the 3 carpal arcs known as Gilula’s arcs. Normally, the arcs should be smooth running parallel to each other. Arc II spans the distal articular surfaces the formerly mentioned carpals. 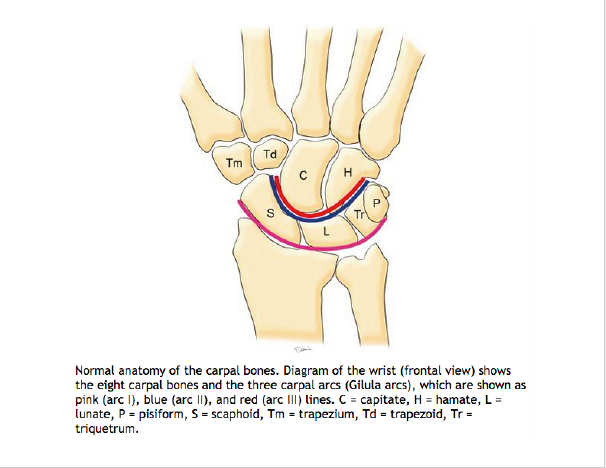 Arc III include the proximal surfaces of the capitate and hamate. 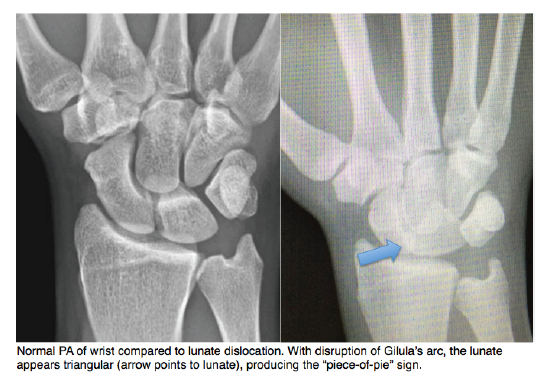 In lunate dislocations, disruption of Gilula’s arcs can be appreciated with disruption of spaces between the proximal and distal carpal bones. The lunate is rotated forming a triangular shape commonly known as the “piece-of-pie” sign. proximally and the capitate distally. The distal 2 Cs indicates the articulation between the lunate and capitate. Classification: The Mayfield classification derived from cadaveric studies on pathoanatomy of carpal ligamentous injury is the most well recognized classification of carpal injuries organized into 4 stages (Karadsheh 2014, Perron 2001). 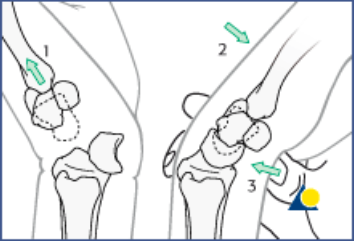 The main differentiating factor between perilunate and lunate dislocation is the lunate’s articulation with the radius. 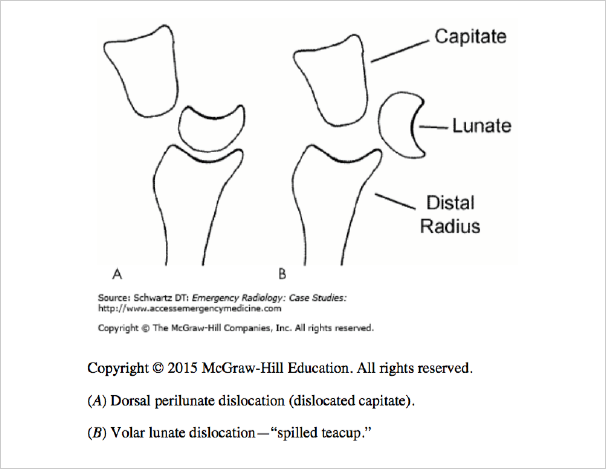 In perilunate dislocations, the lunate’s articulation with the radius is preserved with the capitate dorsally displaced whereas in lunate dislocations, the lunate is disarticulated from both the capitated as well as the radius (Schwartz 2008). Video of closed perilunate/lunate reduction: Lunate or Perilunate Dislocation? 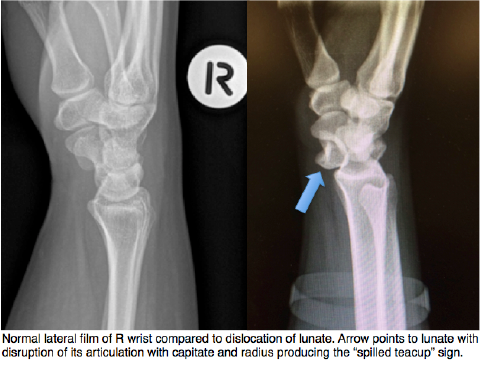 Suspect lunate dislocations in any patient with an appropriate mechanism of injury (FOOSH) and tenderness of the wrist. All lunate dislocations should be emergently reduced and referred for early orthopedic assessment for surgery. Escarza R et al. Chapter 266. Wrist injuries. In: Tintinalli JE, Stapczynski J, Ma O, Cline DM, Cydulka RK, Meckler GD, T. eds. Tintinalli’s Emergency Medicine: A Comprehensive Study Guide, 7e. New York, NY: McGraw-Hill; 2011. Karadsheh M. Lunate Dislocation (Perilunate dissociation). (2012, December 24) [Ortho Bullets] Retrieved from: http://www.orthobullets.com/hand/6045/lunate-dislocation-perilunate-dissociation. Kastelec M et al. Carpus – Complete dislocation of the lunate. 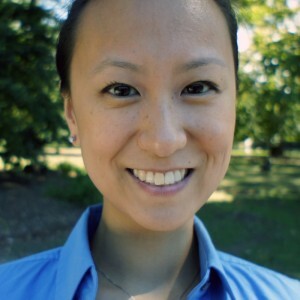 [AO Foundation] Retrieved from http://bit.ly/1Jsrftz. Schwartz DT. Perilunate Injuries. In: Schwartz DT. eds. Emergency Radiology: Case Studies. New York, NY: McGraw-Hill.